With a collection of shorts / previews / etc. on the site of the exhibition. In creating a foundational piece of software infrastructure Ben Fry and Casey Reas have done myself and countless peers a great service and helped launch thousands of arty new-media applets. In Form+Code (F+C) Reas teams up with Chandler McWilliams and LUST design studio to produce a slim introductory text on procedural and code-influenced art and design. While the book makes only the briefest mention of Processing, a good percentage of the work documented in it can be traced directly or indirectly to the platform that emerged from the MIT Aesthetics and Computation work group. F+C also includes historical precedents, from loving documentation of green Cathode Ray Tube Spacewar!, to one of Sol LeWitt's wall drawing instruction cards (presented here as code only — LeWitt's typed out gallery proposal). There are a few other nods to post-minimalism and other pre-P5 projects. Additionally, F+C also breaks out of the screen-based ghetto, including images from proposed and built architectural investigations, art installations, design prototypes and sculptures. The book itself is broken down into conceptual chapters that explore techniques that are code-like or only practically achievable with code-based tools: repetition, geometric transformation, parametrization, visualization, simulation. Each chapter includes spare descriptive pages which introduce overall themes and very briefly discuss the documented projects. F+C is a fairly no-nonesense machine -- it moves briskly through its functional structure of chapters, never pausing to dwell on any one project or image. Yoshi Sodeoka's 2004 video work based on presidential State of the Union addresses is presented in much the same way that Marius Watz's beautiful software generated abstractions are. Both sit alongside a Rafael Lozano-Hemmer installation, an elegant Cory Arcangle data-vis deconstruction, images of a Morphosis tower project for Paris, news-stream visualizations, and Mark Lombardi inspired diagramming. To some extent all these projects (and many others) are being stripped mined for the illustration of a technique or concept. This undifferentiated treatment of a really diverse set of work and ideas is, for me, the primary weakness of the book. Even with some notable omissions in the projects covered, there's likely to be a items here most of us haven't seen yet – I discovered many. 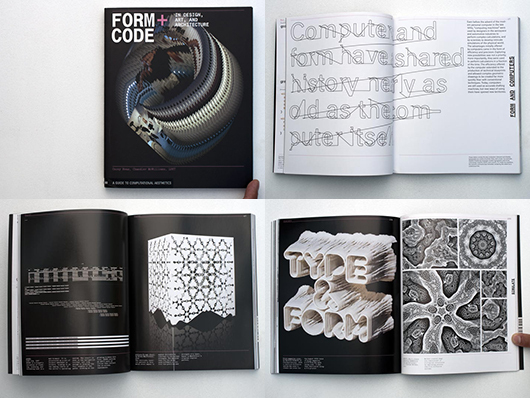 If you are looking for an overview and introduction, or a catalog of interesting work, Form+Code will be a useful resource. Ultimately, though, it leaves me hungry for a more focused and critical approach to this incredibly interesting subject. It's clear that Reas, McWilliams and LUST would be particularly well qualified to produce exactly that sort of text. The more and more code based / behavioral design, documented and commented here in this new book by Casey Reas et al. Many decisions made in our everyday lives are influenced by expert advice, from hairstyles to insurance policies. Yet, millions of decisions are made on a daily basis and instantly expressed through our own facial expressions without any preconceived external reassurance. We continuously strive to project a desired physical self image of ourselves, sometimes requiring most of our cognitive resources, and paradoxically, this daily challenge has a big impact on our lives. Expressions Dispatcher is designed to help people in their quest for expressiveness. Full post with other "devices for mindless communication" here. But the Holy Grail—controlling a computer without touching it—proves hard to achieve. Hand waving: A software plug-in called DepthJS makes it possible to control a Web browser using the Kinect. Soon after Microsoft released the Kinect gaming device, hackers found a way to pull raw data out of the system, radically expanding its potential uses. Enthusiasts have used the hardware to draw 3-D doodles in the air with hand movements, to play with virtual onscreen characters, and allow a robot to recognize gestures and map its surroundings. But one of the biggest goals of Kinect hackers—controlling a computer with gestures—is proving difficult to achieve. Researchers at MIT's Media Lab have created a new Chrome Web browser extension that lets users interact with any Web page via the Kinect plugged into a computer. Their project is one test case for the promise and limitations of hacking Microsoft's gaming peripheral for nongaming uses. The goal isn't really to use the Kinect as a practical means of browsing the Web. Instead, DepthJS is meant to act as the interface between a variety of Web applications and the gestures captured by Kinect. One trouble is that unlike using a mouse, keyboard, or touch screen, there is no widely recognized (or naturally intuitive) vocabulary for gestural computing. Microsoft has developed a small number of gestures to let Kinect users navigate menus and browse media on the Xbox. "Most of us hadn't even used a Kinect with the Xbox before we started working, so we weren't really burdened by the gesture language Microsoft has developed," says Fritz. The team was inspired by the iPhone's multitouch gestures and work by 3-D computing pioneer John Underkoffler. Surprisingly, some of the gestures created for DepthJS are similar to those Microsoft came up with. "Right now we are in that state of rapid change where people are remixing familiar interaction techniques with what feels natural," Fritz said. Limor Fried and Phillip Torrone from Adafruit Industries, a company that supplies equipment to hardware hackers, helped kick off the race to hack the Kinect by putting out a bounty of $3,000 for software that could connect the device to a regular computer. Both are excited about the future of the Kinect as an off-the-shelf sensor for everything from high-end robotics to art projects. Developers have created a steady stream of videos of different applications using the Kinect. "These videos are really just proof-of-concepts that show some of the possibilities for further development," says Fried. One of the most popular videos is of a 3-D interactive puppet. "It's fun, it's intuitive, and it's something that would be really hard to do without this inexpensive, off-the-shelf component. As you bring down the barriers, people have room to get creative." MIT's Fritz is quick to note that three-dimensional, natural user interface computing using gestural recognition and depth sensors has been in play in the research community for years. The Kinect is a breakthrough device in terms of packaging and implementing these technologies for consumers. The more familiar users become with it, the more likely they are to translate it to spheres beyond gaming. "The keyboard and the mouse aren't going anywhere, but there is a lot of space for something more, and I think people are ready for that," Fritz says. But any effort to translate gestures to the screen inevitably bumps into the fact that we're still three-dimensional beings trying to interact with a two-dimensional world. Most Kinect games solve this problem by matching us with an onscreen avatar who imitates our movements. Whether we're dancing, playing volleyball, or whitewater rafting, the characters on the screen perform a stylized version of our movements offscreen. One solution could be to use light projectors to create virtual objects in real space that we can interact with. Microsoft Research has already taken steps in this direction with Mobile Surface, a projector-based multitouch environment. Well... this is the buzz thing at the moment in the Interaction Design field. So lets follow the buzz that opens up new ways for designers to interact with content with a cheap device. You can also check on Creative Applications to look for some early projects by designers. The desire to transcend distance and separation has accompanied the history of media technology for many centuries. Various attempts to realise the demand for a presence from a distance have produced beautiful imaginaries such as those of telepresence and ubiquity, the electronic cottage and the reinvigoration of the oikos, and certainly not least among them the reduction of physical mobility in favour of an ecologically more sustainable connected life style. As current systems of hyper-mobility are confronted with an unfolding energy crisis and collide with severe ecological limits — most prominently in the intense debate on global warming — citizens and organisations in advanced and emerging economies alike are forced to reconsider one of the most daring projects of the information age: that a radical reduction of physical mobility is possible through the use of advanced telepresence technologies. 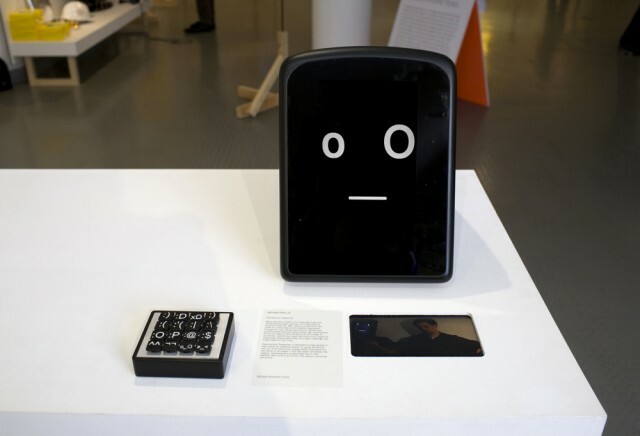 The ElectroSmog festival for ‘sustainable immobility’, staged in March 2010 , was both an exploration of this grand promise of telepresence and a radical attempt to create a new form of public meeting across the globe in real-time. ElectroSmog tried to break with traditional conventions of staging international public festivals and conferences through a set of simple rules: No presenter was allowed to travel across their own regional boundaries to join in any of the public events of the festival, while each event should always be organised in two or more locations at the same time. To enable the traditional functions of a public festival, conversation, encounter, and performance, physical meetings across geographical divides therefore had to be replaced by mediated encounters. The festival was organised at a moment when internet-based techniques of tele-connection, video-telephony, visual multi-user on-line environments, live streams, and various forms of real-time text interfaces had become available for the general public, virtually around the globe. No longer an object of futurology ElectroSmog tried to establish the new critical uses that could be developed with these every day life technologies, especially the new breeds of real-time technologies. The main question here was if a new form of public assembly could emerge from the new distributed space-time configurations that had been the object of heated debates already for so many years? There was a sense of unease when looking back at the bold promises of remoter life and work in the ‘electronic cottage’ that futurologists such as Alvin Toffler spelled out for us in the early 1980s, in books such as “The Third Wave” (the ‘coming information age’ as the third wave, after agricultural and industrial society) . As part of his near-future explorations conducted well before the rise of widespread internet use, Toffler enthusiastically embraced the suggestion that a radical reduction of (physical) mobility would become possible by the rise of ever more sophisticated communication and information technologies and the integration of home and workplace in the electronic cottage. Not only would this transformation, in Toffler’s vision, reap great ecological benefits, it would also initiate a grand revitalisation of the ‘oikos’, the household and the family unit. The electronic cottage should ideally be a real-time connected living and working space, allowing a new kind of digital artisan / entrepreneur to emerge who would be absolved from rush hour-traffic while being ultimately flexible in making his or her own work and private arrangements. The main advantage of the new work/life unit was its inherent efficiency, where meetings would be arranged solely when strictly necessary and flexible according to need and availability of everyone involved in the process. The main element won back from the congested systems of collective work and travel was time. Time that could instead be invested in the ‘oikos‘, the home, family life, and local social relations, that could help to restore the psychic fabric of society, which had become unravelled through the brutal forces of ‘second wave’ grand scale industrial modernisation. Work and life at home could now be brought into unison again. Today, however, more than 25 years after these all bold claims, we can observe exactly the reverse trend: Never before have wo/men travelled more and farther. Not least because of their improved capabilities to keep in touch with the ‘home base’ from afar. With advanced communication techniques work has entered the sphere of private life and mostly diminished the space and time for the oikos. The simultaneous exponential innovation of transport technologies and logistics, in particular in the automobile and aviation industry, have had a cataclysmic effect on this ‘fatal’ trajectory. The system of hyper-mobility has quite literally overheated itself, and seems unstoppably heading for a crash. Even more so, it seems to exhaust itself at an exponential rate. While most people do enjoy living in a global village, few appreciate a forced life in the local village. Rather than moving towards a sustainable immobility, we seem to be heading towards a global ecological disaster scenario. The crucial question for ElectroSmog was whether a critical reconsideration of this idea of a sustainable immobility was possible, both in theoretical and practical terms. 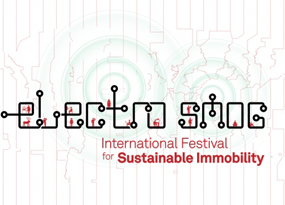 The urgency of the search for alternatives for the current crisis of hyper-mobility was illustrated graphically by the opening conversation of the festival “Global perspectives on the crisis of mobility”. In our first video chat with the crew of Sasahivi media in Nairobi we talked about the daily commute in Kenya’s capital. The city has seen a sharp increase in motorised travel in recent years, leading to over-congested roads and unbearably intense rush hour traffic. To avoid the worst the people at Sasaivi traditionally would leave their homes early in the morning, before rush hour, and return only late, often very late at night. During the day roads were simply too busy. So, how long would a daily commute take? - “about two to three hours”, and what distance would they have to cover? - “about 2,5 to 3 kilometres” (!). Next we connected with Dutch architect Daan Roggeveen who is conducting the research project Go West together with journalist Michiel Hulshof about the development of new metropolises in Central and Western China . They had just come back from a field trip in Wuhan, and Roggeveen explained that they had found that about 500 new cars were entering the streets of Wuhan every day. We then asked him how many cities of similar size were currently present in China, and he replied about 30, not counting Shanghai and Beijing. In short, by a (very) moderate count some 15.000 new cars were entering Chinese roads daily as we spoke. We then listened to a short video message by Partha Pratim Sarker from Dhaka, Bangladesh relating similar experiences and being hopeful that new communication technologies could do something to alleviate the stress of the streets. Next up film maker Aarti Sethi from Delhi told us that by her estimate some 1000 new cars entered Delhi roads every day, especially intensified by the introduction of the Tata, the low cost automobile that obviously replaces many polluting motor-ricksha’s, but still. In a nutshell we received a chilling summary of a global exponential rise of motorised mobility through these first hand reports. With car use, air travel and motorised transportation not diminishing in the developed economies this system of hyper-mobility out of control seems to approach its limits rather sooner than later, and virtually all counter-strategies so far seem entirely ineffective. Imaginary Media are machines that mediate impossible desires. Imaginary media typically emerge in situations where the living environment imposes inherent limitations that one cannot transcend. The desire to exceed these limitations produces beautiful phantasies, and in the case of imaginary media they are projected onto technological systems — both existent and inexistent — that are supposed to realise what an ordinary human existence is unable to deliver. Imaginary media are the techno-imaginary constructs that populate the domain of impossibility. One manifestation of this desire to transcend the limitations of living experience is the longing for immediate contact across any distance or divide. And it is this desire for a ubiquitous telepresence, replacing the actual presence here and now, more than anything else, that has fuelled the development of new media and communication technologies. This desire is in fact so strong that even in lowest bandwidth environments tremendous investments of mental and emotional energy can be observed, across different technological and historical settings (recent examples are for instance the IRC text chat or SMS text messaging). ‘Signal’ in these case is interpreted as ‘contact’, and a phantasmatic projection of connection and interaction is projected onto the faintest of signals, aided further by the curious emergence of synaesthetic perceptions where minute changes in tone, rhythm or even wording can produce intense bodily sensations and responses. This intermingling of imaginary and actual qualities of connection-media has obscured the discussions about the benefits and limits of telepresence technologies thoroughly. Regardless if one is talking about mobile phone use, deep technological experimentation in telepresence labs, on-line virtual environments of the Second Life type, high powered tele-work centres, or more regular real-time web applications and video chat systems, it seems very difficult to escape this aspect of the phantasmatic. Critical scrutiny, however, needs to cleanse itself from these phantasmatic distortions if it is to get anywhere with its task of establishing clear boundaries and areas of possibility. For ElectroSmog the central question was, can we convene a public event, a festival, with everything you might expect from it, where audiences and presenters from a host of different countries and regions of the earth can meet, interact, encounter, exchange without having to travel outside of their locale? Or in even more mundane terms, can an international festival be staged without anybody travelling and still be a viable public event? And while the technologies used worked fine most of the time, the answer to this central question was clearly “No”. However, this ‘failure’ became clear in a rather surprising way. What the festival showed through its radical approach to this question is that remote connection works excellent in an active network. In situations where connections were established between active contributors to a discussion or project, exchange was often very productive and the experience rewarding for all participants. But when attempts were made to integrate a public of relatively passive observers, the traditional ‘audience’, the experience broke down. Remote connection also did not bring people together locally. The overwhelming sense of all festival events was that in the (remote) communicative process all nodes of the network must be active ‘throughout’. No real sense of co-presence between local audiences in different sites (even though they were often visible and audible to each other) came about, while locally audiences seemed little inspired to physically show up at the networks nodes to witness a process they could also follow from the comfort of their home via the webcast. The interesting question here is why? Could playful interfaces, allowing audiences to interact across different localities have helped to create this sense of co-presence? Certainly it would have helped to create this sense in situations where audiences were actually present in different connected spaces. However, curiously, exactly those programs were generally well visited that showed strong local participation and a minimum (the ‘at least one’ rule) of connected localities. Much can be done to improve the experience, but even in the deliriously transmediated environment of the ElectroSmog central connection node, the theatre space of De Balie in Amsterdam, the energy never entirely seemed to materialise. The rather inevitable conclusion that must be drawn from this is that the idea of a replacement of physical encounters by mediated encounters is simply an illusion. 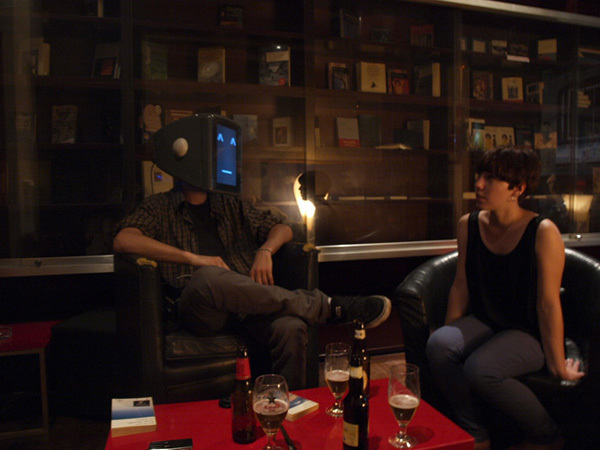 First of all, this mediated encounter denies the unspoken subtle bodily cues that shape actual conversation.The experience of co-presence in the same space is determined by so many perceptible and sub-liminal incentives that digital electronic media do not capture, that the idea of an immersive experience relies more on the phantasmatic cover of these absent cues and the curious human capacity for synaesthetic perception, than on the performative capabilities of the medium. A digital video-link certainly does not replace these subliminal cues. 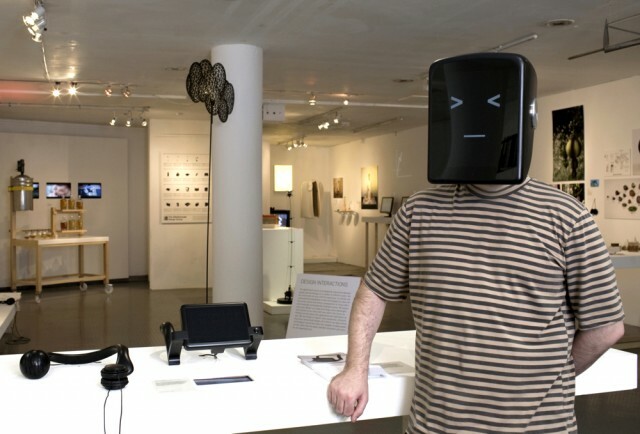 Still, more important for the ultimate failure of the telepresence ideology is that it denies the libidinal drive for encounter, belonging, and identification that is so important for a successful staging of a public event such as an arts and culture festival.There is also a sobering lesson for curators that excellent content and contributors as such do not translate into public success. The desire for sharing the space with others and with the influential in a particular social circle or figuration, is a much stronger motor it seems for public appeal. Remoteness, one of the themes in the festival, cannot be so easily transcended in the telepresence scenario as hoped for. It is this libidinal drive for connection, identification and belonging that propels the development of new media and communication technologies. These technologies are greeted with great enthusiasm as long as they are able to conjure up a phantasmatic image of connectedness that is able to cover (u)p the lack of actual presence and (physical) contact. However, this phantasmatic projection is never able to displace the feeling of a lack entirely, and thus a surplus desire remains that needs to be satisfied by other means. The consequence is that an intensified use of communication technology does not lead to less, but instead to an increased desire for physical encounter. This observation is also remarkably concurrent with what mobility researchers have concluded about the actual behaviour of people in environments deeply saturated with advanced communication technologies. While some effects can be observed that can lead to a moderation of certain forms of travel and transport (tele work, on-line and phone conferences and so on), the indirect generative effects of these communication media tend to create intensified mobility patterns in these same regions (i.e. not necessarily work of profession related). Communication media serve all kinds of practical purposes, obviously, and also those that can replace the necessity of physical encounter, movement, travel and its associated hassles. There is, however, a point at which the lack presence and contact brings the phantasmatic projection of the technologically enabled communication process to a point of crisis. And this is the moment when people start up the engine of their cars - the moment when the imaginary medium and the libidinal drive meet in a frontal crash. In all this the urgency of our quest for a sustainable immobility is not lessened. The apparent failure of telepresence technologies leaves us stranded with a huge dilemma. Not to act is really not an option given the intensified pressures of a mobility system out of control. But are there any solutions? Unfortunately there are as yet not too many reasons to be hopeful. The first step forward towards a new more sustainable regime of mobility and connectivity, and a new balance between mobility and immobility, would be not to believe in linear narratives, neither positivistic nor fatalistic. More communication technology does not automatically lead to less physical mobility. But equally, the current systems of hyper-mobility cannot grow at an exponential rate indefinitely. They will encounter new energetic, ecological, and with that also increasingly economic limits. The other observation that mobility researchers generally point to (next to the failure of communication technology) is that price is about the only mechanism that does seem to have a discernible effect on actual (mobility) behaviour. As currently widely used energy systems (fossil fuels) become increasingly scarce, their price will inevitably go up. This will transform mobility from a right (or a perceived right) into a privilege, constructed along the traditional lines of socio-economic segregation (income, profession, class). The struggle over the privileges of mobility and movement will create a new consciousness about their spatial deployment (who is allowed to travel where and by which means?). This new consciousness of segregation will undoubtedly spark conflict and critical debate. The least desirable scenario is that of the crash, the ‘accident-catastrophe’ preprogrammed in current systems of hyper-nobility. Given the tidings from a confused planet rushing at high-speed into a global traffic jam, reported at ElectroSmog, this scenario cannot be excluded from our considerations for now. 2 - Alvin Toffler, The Third Wave, Bantam Books, New York, 1980. The text is an extended version of a talk given at Impakt Festival 2010 “Matrix City”, in Utrecht as part of the Superstructural Dependencies Conference, October 15, 2010. We already published around this question of "mediated mobility" or "immobile mobilities" within the frame of the sustainable approach on | rblg. John Thackara is on this question too and it interests us quite a lot in the context of future projects. We published on this particular event some time ago and this is an interesting, yet nuanced follow-up by Eric Kluitenberg about the "ubiquity" and/or "tele-" concepts.